Francis and Emilia were enumerated in the 1900 Richmond, Richmond Co., NY, federal census. He was 60, she was 40. Children in the household were Francis E. 18, Perci P. 14, and Donald 13. The widow Amelia was enumerated in the 1910 Chicago, Cook Co., IL, federal census. She was 54. Children in the household were Francis E. 27, Percy P., and Donald S. 23. Percy and Katherine were enumerated in the 1920 Meriden, New Haven Co., CT, federal census in the household of his mother-in-law, Arvilla Warnock. He was a sales engineer in a cabinet hardware manufacturing shop, age 34, she was 26. John attempted to assassinate U.S. President Ronald Reagan in Washington, D.C. on March 30, 1981, as the culmination of an effort to impress actress Jodie Foster. He was found not guilty by reason of insanity and has remained under institutional psychiatric care since then. 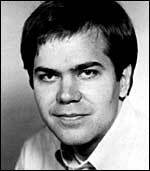 John Hinckley, Jr. was born in Ardmore, Oklahoma to John Warnock Hinckley, Sr. and Jo Ann Moore. He has two siblings – sister Diane and brother Scott. Hinckley grew up in University Park, Texas and attended Highland Park High School in Dallas County, Texas. The family, owners of the Hinckley Oil company, later settled in Evergreen, Colorado. An off-and-on student at Texas Tech University from 1972 to 1980, in 1975 he headed to Los Angeles in the hope of becoming a songwriter. These efforts were unsuccessful, and his letters home to his parents were full of tales of misfortune and pleas for money. He also spoke of a girlfriend, Lynn Collins, who turned out to be a complete fabrication. He returned home to the home of his parents in Evergreen, before the year was out. Over the next few years he developed a pattern of living on his own for a while and then returning home poor. After repeated viewings of the 1976 movie Taxi Driver, in which a disturbed protagonist, Travis Bickle, played by Robert De Niro, plots to assassinate a presidential candidate, Hinckley developed an obsession with actress Jodie Foster, who had played a child prostitute in the film. The Bickle character was in turn based on the diaries of Arthur Bremer, the attempted assassin of George Wallace. When Foster entered Yale University, Hinckley moved to New Haven, Connecticut for a short time to stalk her, slipping poems and messages under her door and repeatedly contacting her by telephone. Failing to develop any meaningful contact with Foster, Hinckley developed such plots as hijacking an airplane and committing suicide in front of her to gain her attention. Eventually he settled on a scheme to win her over by assassinating the president, with the theory that as a historical figure, he would be her equal. To this end, he trailed President Jimmy Carter from state to state, but was arrested in Nashville, Tennessee on a firearms charge. Penniless, he returned home once again, and despite psychiatric treatment for depression, his mental health did not improve. In 1981, he began to target the newly elected president, Ronald Reagan. It was also at this time that he started collecting information on Lee Harvey Oswald, John F. Kennedy's assassin, whom he saw as a role model. "Over the past seven months I've left you dozens of poems, letters and love messages in the faint hope that you could develop an interest in me. Although we talked on the phone a couple of times I never had the nerve to simply approach you and introduce myself. [...] the reason I'm going ahead with this attempt now is because I cannot wait any longer to impress you." On March 30, 1981, Hinckley fired a .22 caliber Röhm RG-14 revolver six times at Reagan as he left the Hilton Hotel in Washington, D.C. after addressing an AFL-CIO conference. The gun, which cost $47.00, was manufactured by Röhm Gesellschaft, a West German company, and assembled in Miami by its American subsidiary, R.G. Industries, Inc. ATF agents determined that the gun was bought at Rocky's Pawn Shop in Dallas, Texas. It was loaded with six Devastator rounds, which have lead azide-filled centers within lacquer-sealed aluminum tips designed to explode on impact, though all failed to do so. Hinckley wounded press secretary James Brady, police officer Thomas Delahanty, and Secret Service agent Timothy McCarthy. Hinckley did not directly hit Reagan, but seriously wounded him when a bullet ricocheted off the side of the presidential limousine and hit him in the chest. Hinckley did not attempt to flee and was arrested at the scene. All of the shooting victims survived, although Brady, who was hit in the right side of the head, endured a long recuperation period and remained paralyzed on the left side of his body. At the trial in 1982, charged with 13 offenses, Hinckley was found not guilty by reason of insanity on June 21. The defense psychiatric reports found him to be insane while the prosecution reports declared him legally sane. Hinckley was confined at St. Elizabeths Hospital in Washington, D.C. The verdict led to widespread dismay; as a result, the U.S. Congress and a number of states rewrote the law regarding the insanity defense. Idaho, Kansas, Montana, and Utah have abolished the defense altogether. In the United States prior to the Hinckley case, the insanity defense had been used in less than 2% of all felony cases and was unsuccessful in almost 75% of the trials in which it was used. Hinckley's parents wrote a book in 1985, Breaking Points, about their son's mental condition. As further fallout from the verdict, federal and some state rules of evidence exclude or restrict testimony of an expert witness' conclusions on "ultimate" issues drawn by expert witnesses, including that of psychologist and psychiatrist expert witnesses on the issue of whether a criminal defendant is legally "insane". However, such is not the majority rule among the states today. Shortly after his trial, Hinckley wrote that the shooting was "the greatest love offering in the history of the world", and was upset that Foster did not reciprocate his love. After being admitted, tests found that Hinckley was an "unpredictably dangerous" man who may harm himself, Jodie Foster, and any other third party. In 1983 he told Penthouse that on a typical day he will “see a therapist, answer mail, play (his) guitar, listen to music, play pool, watch television, eat lousy food, and take delicious medication”. He was allowed to leave the hospital for supervised visits with his parents in 1999, and longer unsupervised releases in 2000. These privileges were revoked when he was found to have smuggled materials about Foster back into the hospital. Hinckley was later allowed supervised visits in 2004 and 2005. Court hearings were held in September 2005 on whether he could have expanded privileges to leave the hospital. Some of the testimony during the hearings centered on whether Hinckley is capable of having a normal relationship with a woman and, if not, whether that would have any bearing on what danger he would pose to society. On December 30, 2005, a federal judge ruled that Hinckley would be allowed visits, supervised by his parents, to their home in Williamsburg, Virginia. The judge ruled that Mr. Hinckley could have up to three visits of three nights and then four visits of four nights, each depending on the successful completion of the last. All of the experts who testified at Mr. Hinckley's 2005 conditional release hearing, including the government experts, agreed that his depression and psychotic disorder were in full remission and that he should have some expanded conditions of release. After requesting further freedoms including two one-week visits with his parents as well as a month long visit, U.S. District Judge Paul L. Friedman denied that request on Wednesday, June 6, 2007, but not because Hinckley wasn't ready. "The reasons the court has reached this decision rest with the hospital, not with Mr. Hinckley," Friedman said, adding that Hinckley's prior visits have been uneventful and his family has done all that has been asked of them. "Unfortunately, the hospital has not taken the steps it must take before any such transition can begin". According to the March 31, 1981, edition of the Houston Post, and reported by AP, UPI, NBC News and Newsweek, Hinckley is the son of one of George H.W. Bush's political and financial supporters in his 1980 presidential primary campaign against Ronald Reagan; John Hinckley Jr.'s elder brother, Scott Hinckley, and Vice President Bush's son Neil Bush had a dinner appointment scheduled for the next day. "The family of the man charged with trying to assassinate President Reagan is acquainted with the family of Vice-President George Bush and had made large contributions to his political campaign ... Scott Hinckley, brother of John W. Hinckley Jr. was to have dined tonight in Denver at the home of Neil Bush, one of the Vice-President's sons ... The Houston Post said it was unable to reach Scott Hinckley, vice-president of his father's Denver-based firm, Vanderbilt Energy Corporation, for comment. Neil Bush lives in Denver, where he works for Standard Oil Company of Indiana. In 1978, Neil Bush served as campaign manager for his brother, George W. Bush, the Vice-President's eldest son, who made an unsuccessful bid for Congress. Neil lived in Lubbock, Texas, throughout much of 1978, where John Hinckley lived from 1974 through 1980." Elizabeth de Clare was born on 16 September 1295. She was the daughter of Gilbert de Clare 3rd Earl of Gloucester, 7th Earl of Hertford and Joan Plantagenet.1 Elizabeth de Clare married Sir Theobald de Verdun on 4 February 1316.1 Elizabeth de Clare died in 1360. John Chadwell married Mary Allen, daughter of Valentine Allen and Nancy Anne Arnold. Joan Plantagenet was born in 1272. She was the daughter of Edward I, King of England and Eleanor of Castile.1 Joan Plantagenet married Gilbert de Clare 3rd Earl of Gloucester, 7th Earl of Hertford on 30 April 1290 at Westminster Abbey.1 Joan Plantagenet died on 23 April 1307. [S618] Gary Boyd Roberts, Royal Descents, page 278. Mark Anthony Welch was the son of Dr. William Franklin Welch and Nancy Jane Aldridge. Mark Anthony Welch married Marie Lula Lane. Dr. William Franklin Welch married Nancy Jane Aldridge, daughter of James T. Aldridge and Mary Chadwell. James T. Aldridge married Mary Chadwell, daughter of David Chadwell and Jane Johnson. David Chadwell was the son of John Chadwell and Mary Allen. David Chadwell married Jane Johnson. [S618] Gary Boyd Roberts, Royal Descents, 825. [S676] Gary Boyd Roberts, Presidents 2009 Edition, page 15. Griffith Hampden was born in 1543 at Great Hampton, Buckinghamshire, England. He was the son of John Hampden and Elizabeth Ferrers.1 Griffith Hampden married Anne Cave circa 1555 at Great Hampton, Buckinghamshire, England.1 Griffith Hampden died on 27 October 1591 at Great Hampton, Buckinghamshire, England. Louisa Clark was the daughter of Francis Clark and Abigail Kimball. Louisa Clark married Garner Woolson. Abigail Kimball was born on 14 July 1786 at Haverhill, MA. She was the daughter of Amos Kimball and Abigail Corliss. Abigail Kimball married Francis Clark. Abigail Kimball died in 1869 at Geddes, NY. Abigail Corliss was born in 1756. She married Amos Kimball, son of Abraham Kimball and Mary Pike, on 20 February 1774. Abigail Corliss died on 11 October 1803. Edward I, King of England also went by the name of Longshanks. He was born on 17 June 1239 at Westminster, London, Middlesex, England. He married Eleanor of Castile on 1 November 1254 at Monastery of Las Huelgas.1 Edward I, King of England died on 8 July 1307 at Burgh-by-Sands, Cumbria, England, at age 68.